Pyrene-imprinted microbeads that display molecular recognition towards polyaromatic hydrocarbons (PAHs) were obtained by the aqueous suspension thermopolymerization of a mixture of template, 4-vinylpyridine and divinylbenzene in the molar ratio of 1:8:40. 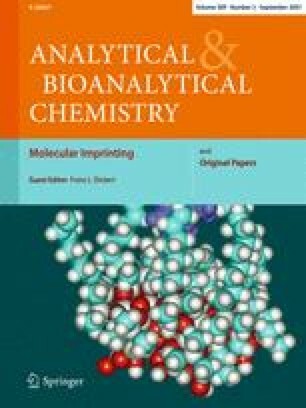 The microbeads were packed into an HPLC column and the retention behaviour of pyrene in the presence of eluents of increasing polarity was investigated by measuring the binding capacity and the imprinting factor. Selectivity was evaluated by eluting pyrene and 22 other related PAHs in the HPLC column when equilibrated with acetonitrile–dichloromethane 4:1 (v/v). Twelve molecular descriptors were calculated for each PAH molecule: MW, the molecular weight; SAS, the solvent-accessible molecular surface area; Svdw, the van der Waals molecular surface area; Vol, the van der Waals molecular volume; MOv, the molecular ovality; RG, the radius of gyration; B/L, the breadth-to-length ratio; μ 2, the square of the total dipole moment; HOMO, the highest occupied molecular orbital; LUMO, the lowest unoccupied molecular orbital; Δorb, the absolute value of the difference between the HOMO and LUMO; log P, the logarithm of the n-octanol–water partition coefficient. Quantitative structure–retention relationships between the logarithm of the capacity factors and these descriptors were searched for using a multiple linear regression (MLR) method. The best regression models obtained showed that the capacity factor correlated well with those molecular descriptors which had structural character, such as logP, while the effect of the molecular descriptors with electronic character was negligible. The results obtained indicate that the molecular recognition of PAHs by the imprinted polymer is controlled by the shape and dimension of the binding sites through hydrophobic interactions. Retention and imprinting factors of PAHs on the impinted and not-imprinted columns. The area under the lower diagonal line (IF = 1.0) corresponds to the absence of imprinting effect for the interaction between the stationary phase and a given PAH. The authors gratefully acknowledge the Water Research Institute of CNR (Milan, Italy) and the Piedmont Regional Agency for Environmental Protection—Food Division (Torino, Italy), which kindly furnished samples of PAHs.